Bought the car in Florida three weeks ago, and had an independent, import repair shop check it out before starting 1, 200 miles back to Texas. The only issue was a leaking primer pump, which I had replaced for $170.00, all inclusive. Complete maintenance records show that control arms, tie rods, all bushings and shocks have been replaced, as well as the radiator and fan. Two months ago, the car ran hot (due to fan failure? ), and the head warped and cracked. Repair invoice notes describe $2, 400 for various related and precautionary repairs. The rheostat on the instrument lights does not work, so their constant dim glow is only visible if there is zero ambient light. Does anyone know a source for that part, or the MB part number, for search purposes? Also, the console switch for the emergency flashers is inoperable. Anyone know a source for that, or the MB part number? Central locking from the driver's door is fine, but not from the passenger's side. May be a vacuum leak on that side. I bought from the original owners, a couple in their mid to late 80s. The factory paint, light gray with original pin striping is superb, as are the carpets, MB Tex dark blue upholstery and carpets, which show no discernible wear. The car has clearly been pampered all its life, and I expect it to be my last car purchase, for daily use. Maintenance records show oil and filter changes at least every six months, even if driven only 1, 000 miles. 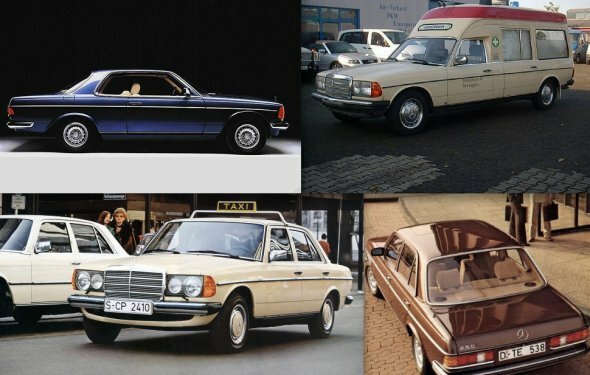 In the early 1960s, in Germany, I owned a 1958 MB 219, which I totalled and replaced with a 1957 MB 220S. I had never driven such fine cars, and have never forgotten what it was like. This W123 has the same feeling of quality and precision road feel of those earlier cars. I am now 73 years old, but can still feel thrilled over driving a fine car. This one gives me that thrill.